St. Joseph Cathedral is a 19th-century neo-Gothic church built with the Notre Dame of Paris in mind. The church is a gathering place for the large Roman Catholic community of Hanoi and is also popular with tourists. Constructed when the French first occupied the city, St. Joseph Cathedral is a striking example of colonial architecture in Hanoi. In order to build the church, the French demolished the ancient Bao Thien pagoda that had stood there for more than 800 years. The contrast between the two religious buildings was dramatic. St. Joseph Cathedral’s neo-Gothic cross, towers and nave are distinctly European. At 211 feet (64.5 meters) long and with bell towers reaching 103 feet (31.5 meters) high, it’s an imposing structure. When you walk west from Lake Hoan Kiem to reach St. Joseph’s you’ll see the church’s faded exterior in the distance. The area around the cathedral is popular and its streets are lined with trees, hotels and boutique stores. Many visitors find this area a pleasant break from the more hectic Old Quarter. You enter the church through the side door, not the main entrance. Inside, the original stained glass windows and religious murals maintain the traditional, European style of St. Joseph’s exterior. There are also traditional Vietnamese decorations adorning the aisles, walls and altar. St. Joseph Cathedral is located just west of Lake Hoan Kiem, close to several bus routes and walkable from the Old Quarter. Entry to the church is free. Opening hours are known to fluctuate, and you’ll likely find the church closed at lunchtime. Services are held throughout the week and the church is often full. Located in Hoan Kiem, this hotel is within a 10-minute walk of Vietnamese National Tuong Theatre and St. Joseph's Cathedral. Hanoi Old City Gate and Thang Long Water Puppet Theatre are also within 15 minutes. Hanoi Long Bien Station is 15 minutes by foot and Hanoi Railway Station is 16 minutes. 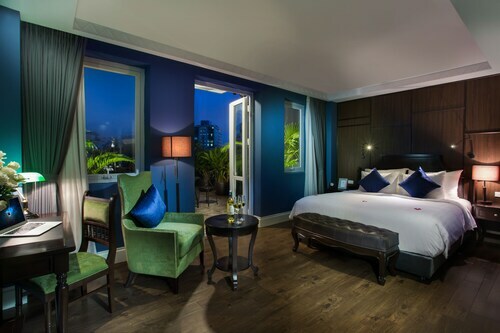 This family-friendly Hanoi hotel is located in the business district, within a 15-minute walk of Hanoi Opera House, Thang Long Water Puppet Theatre, and Ngoc Son Temple. Hoan Kiem Lake and Hanoi Old City Gate are also within 1 mi (2 km). Hanoi Long Bien Station is 26 minutes by foot and Hanoi Railway Station is 26 minutes. Located in Hoan Kiem, this hotel is within a 10-minute walk of Hang Da Market, St. Joseph's Cathedral, and Hoa Lo Prison Museum. Thang Long Water Puppet Theatre and Hanoi War Museum are also within 15 minutes. Hanoi Railway Station is 12 minutes by foot and Hanoi Long Bien Station is 19 minutes. 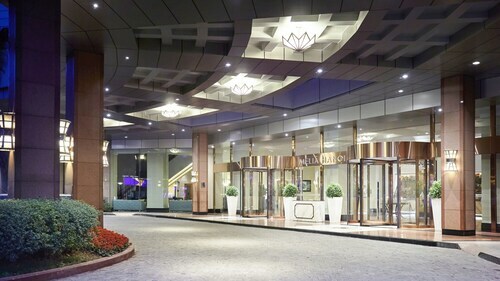 Situated in the business district, this family-friendly hotel is close to Hang Da Market, St. Joseph's Cathedral, and Hanoi Old Town Night Market. Also nearby are Hoan Kiem Lake and Temple of Literature. Hanoi Railway Station is 12 minutes by foot and Hanoi Long Bien Station is 19 minutes.